There comes a point in commentary on particular musical artists when words become superfluous. Sometimes it would be more meaningful to say, “Here, just listen!” I often find myself putting London-based Stile Antico in such company. The young, thrilling group is, astonishingly, approaching its 10th anniversary season, continuing to release record after ground-breaking record while touring extensively. 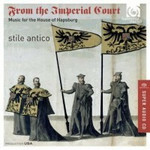 Their latest release, “Music from the Imperial Court,” delves into compositions written for the Hapsburg dynasty and embarks on another journey of discovery through unparalleled musicianship. Stile Antico’s program is fascinating and the strength of the musical content continuously compels. The wealth of material, almost all edited here by the group itself, makes for a generous recording. Yet it is the richness of the music itself that captivates the listener. The music, some of which is nearly 500 years old, is so varied in its subtleties that close listening can be an inspired journey. Take the sensuous words of the two settings of Mille regretz, both quite different musically, the mournfulness of the poetry, set so intimately by Josquin and even more plainly by Gombert is still so immediate to the listener today. And this is just as applicable to the sacred texts, where the homophonic blocks of the second part of Morales’ Jubilate Deo, stir a populist reaction in the listener. Indeed, one of the most enlightening qualities of this collection is the synthesis of the secular and sacred that these Renaissance masters were able to achieve. Alongside well-known masters such as Tallis and Josquin, the Quis dabit oculis of the Swiss composer Ludwig Senfl, written to commemorate Emporer Maximilian I, more than sets itself apart. The moving setting of the poignant text, “Who will give our eyes a fountain of tears that we might weep to the heart of the Lord?” is spine-tingling in its imagery, drawing the listener in to the sorrow. And it is upon this solid foundation of musical wealth that Stile Antico adds its unparalleled skills as the preeminent early music chorus in the world today. The group of 12, always perfectly in tune, are vocally sublime here. They achieve an almost mechanical precision in the exposed polyphony of the opening piece and are even more impressive in the conclusions of pieces like Gombert’s Magnificat. Vowels, diction, color, are majestically aligned which provides the group all manner of expressive range, which they use to great effect. The core of sound remains the same at either extreme of the dynamic spectrum and Stile Antico use this remarkably well in building the texture (sans conductor) in a piece such as Carole magnus eras. The ensemble this group achieves is spotless. The recorded sound is sublime and allows the most musical of expression to reach the listener. The surround channels are very well balanced, not overwhelming, but just right in giving the listener a fantastic perspective on the space. The liner note essay is an outstanding introduction. The culmination of the program is the remarkable Virgo prudentissima of Heinrich Isaac. The soloists are dazzling in their vocal technique. The piece is a perfect summation of the musical wealth on the program: a piece displaying many styles on an inspiring text on many levels. Here, Stile Antico give it a reference performance, one that highlights the amalgam of emotions in the piece, sung with the utmost virtuosity. This truly is music fit for a King.